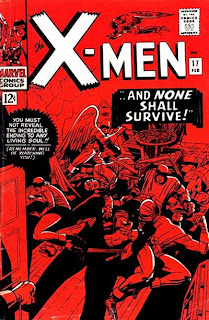 Plot: In the wake of the Sentinels' destruction, the X-Men are treated by paramedics and taken to a hospital for further treatment, with a near-comatose Iceman in the worst shape (apparently the heat last issue took A LOT out of him). Professor X looks in on his students while downplaying their relationship in order to maintain their cover. Angel learns his parents are coming to the school to visit him, and Professor X quickly dispatches him to investigate the sense of vague menace he's picking up from the school. At the mansion, Angel is quickly dispatched by an unseen foe. When he fails to check in, Professor X and Cyclops return to the school and an alarming Cerebro. They are also defeated by an unseen foe. Finally, Beast and Marvel Girl leave the hospital for the school and are also taken by surprise. 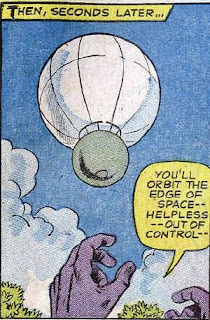 The mysterious foe places the defeated X-Men inside a steel gondola attached to a balloon and sets them aloft to drift into the upper atmosphere, and their demise. As Iceman's condition worsens, Angel's parents are greeted at the mansion door by the X-Men's unseen enemy: Magneto. 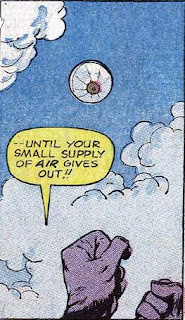 Firsts and Other Notables: Magneto returns from his journey into outer space with the Stranger (in issue #11), though the details will be covered in the next issue. This is Jack Kirby's final work on the title. He's only done layouts since issue #12, but this is the last issue that can be considered in any way part of "Lee and Kirby's" X-Men run. 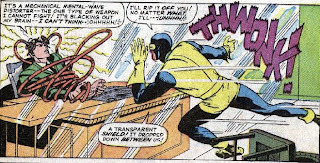 A Work in Progress: Apparently a "mental-wave distorter" is the one type of weapon Professor X can't fight. I'm fairly certain it never gets used again. Ah, the Silver Age: Beast refers to one of the doctors as "Doctor Kildare", a reference to the 1960s TV show by the same name. Answering machines are called "automatic phone answering devices", apparently. 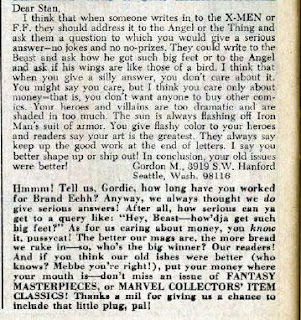 Beast admonishes Marvel Girl for worrying about the others, saying it's "just like a woman." I understand the school of thought that says every comic book is somebody's first (and thus, the basic premise of the book and the main characters' traits need to be established in every issue), and that's especially true in the Silver Age, but having Marvel Girl forget what her power is just so Stan has an excuse to explain it to a theoretical new reader just seems lazy. 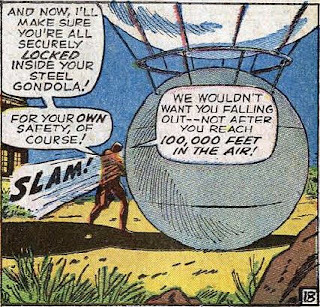 Magneto pulls out one helluva Silver Age-style death trap: instead of simply killing the defeated, unconscious X-Men he sends them into the air to die inside a steel gondola attached to a large balloon. Unnecessary spoiler alert: the X-Men escape this trap and return to foil Magneto's plans next issue. 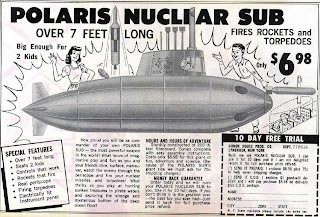 A mail-order seven foot long sub two kids can ride in, that fires rockets and torpedoes for $6.98? 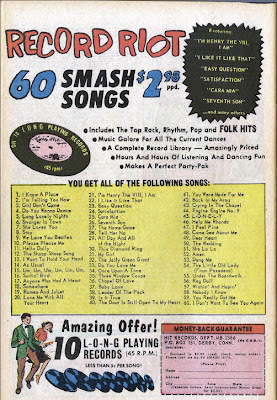 Even adjusted for inflation, that seems entirely too good to be true. 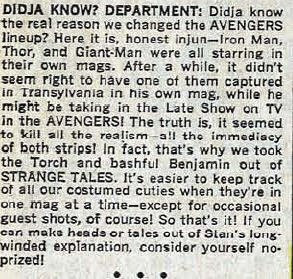 Bullpen Bulletins: Back in the day, Stan seemed to share Dr. Bitz's concerns about characters appearing in multiple titles at once. In fact, that's his stated reason for shaking up the Avengers lineup. It's in the Mail: This writer seems especially cranky. Teebore's Take: So who is shocked that Magneto's back? Anyone? After a mere five issue absence (which, granted, was a longer time back then than now) Magneto returns (plus, those five issues were essentially only two stories, one featuring the Juggernaut, the other the Sentinels). Bringing back the X-Men's arch enemy, on the surface, isn't such a bad idea (though after this storyline, he'll disappear again for a few years). 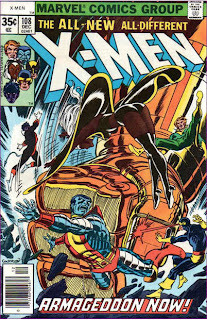 What really hampers this issue, though, is that in order to keep his identity a secret until the end, Magneto cannot use his powers, and instead manages to defeat the X-Men by somehow turning the mansion into a series of death traps. And even they aren't very good death traps, as, for example, Beast is essentially defeated by a slippery floor and Cyclops by turning off the lights. Couple that with the fact that on the very short list of "mystery villains we already know (or else it wouldn't be shocking!)" Magneto sits firmly at the top of said list, and the payoff of this issue doesn't forgive its execution. That sounds like an awesome issue- i can especially tell by the cover- being all dramatic in red and stuff. I dunno...that sub alternately screams "rip off" and "death trap" to me. I'm frankly kinda surprised no urban legends about kids dying in one exist. How is it possible for Angel to be floating in that hospital room? He can't be flapping his wings, cuz if he were i'm sure he'd hit some of those nurses and break their necks. Why doesn't he just use the phone while he's standing quietly? 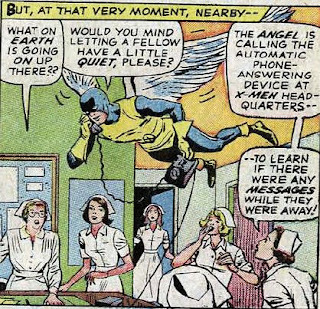 If I recall correctly, Angel is flying whilst on the phone because he's making sure the nurses won't see the number he dialed, and possibly to keep them from overhearing the conversation he'll soon be having with his parents. 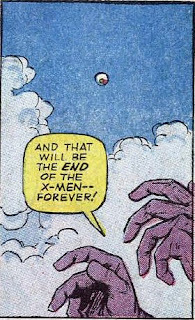 This issue was real big on stressing the importance of the X-Men's secret identities, presumably because Angel's parents are threatened by the end of it. Xavier spends most of the issue telepathically talking to the X-Men while pretending to merely be a semi-curious bystander when talking verbally with the doctors about the X-Men. As for how Angel is flying in that cramped space, well, uh...hey, Magneto's back!